Inspire your baby to sign! Recommended by speech therapists, the adorable Baby Sign and Learn animated characters make learning so much fun! 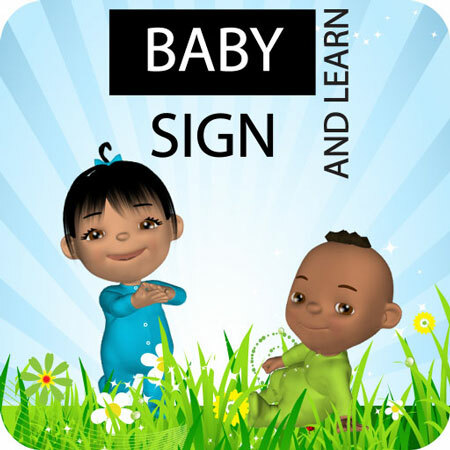 The Baby Sign and Learn app features cute animated video demonstrations that will captive your child. 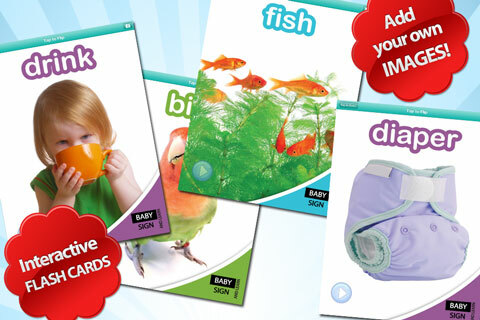 Practice by playing the fun interactive quiz and inspire your baby to sign with the aid of the colorful flashcards. This app uses keyword signs in American Sign Language (ASL). 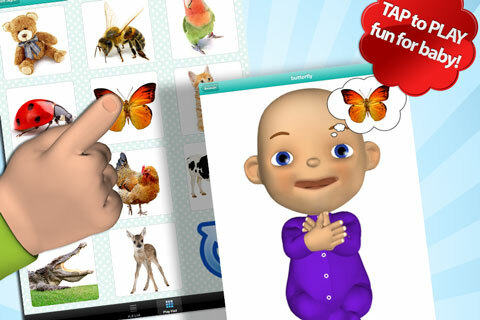 This app is free to allow you an opportunity to sample the many features and to try a few signs with your child. Then, if you would like to continue, please consider buying the full version which contains a great selection of baby's first signs. The full version can be purchased by following the screen prompts within the app. *Images depict Baby Sign and Learn for iPad. Technical support information for this App can be found in the Baby Sign and Learn for iPhone Support FAQ and the Baby Sign and Learn for Android Support FAQ. How will this app help me? Will this app teach my baby to sign? No. Sign language is visual language; baby sign language adds an additional element to this form of communication because it combines speech with sign language. This cannot be accurately conveyed in a book. It is most effectively taught in person. However the majority of parents do not have pre-existing knowledge of sign language nor do they have someone readily on hand to teach them. The Baby Sign and Learn app provides an easy way for parents to learn new signs and discover the types of signs commonly of interest to babies. Baby Sign Language is usually taught one sign at a time. Once a baby masters the use of one sign the parent will then choose another sign to teach the baby. The parent usually selects a sign that will be useful or fun for the baby to learn. The app makes it easy for you to learn new signs in a convenient way while you are taking care of your baby. The app has been designed with the idea in mind that your baby may be sitting on your lap as you search for a new sign to learn. While you go about the task of choosing a new sign to learn and committing it to memory, your baby can be watching the app and enjoying the funny animated babies as they sign. This makes the process of learning new signs convenient for you and entertaining for your baby. Learning to communicate requires at least two people. When babies are learning to communicate their efforts need to be rewarded and reciprocated by their parents. The app can help by giving you and your baby something to "talk" about. This video shows a baby girl using the app. She is quite skilled at navigating through the app. The little girl enjoys watching the signing videos and imitating the signs in the app. She is a clever little girl indeed! At first glance it looks as though the app is teaching her to sign. However, this is only a superficial assessment of what is going on here. What is really happening is that the little girl has two very engaged parents sitting off camera. Throughout the entire video the parents are talking to their daughter and encouraging her to communicate...with them! You will notice that the little girl’s eyes are constantly going from the app to her parents. When she signs they offer her praise. As a result, she is happy with her efforts. You can almost see her confidence grow as she attempts more signs. The parents sound delighted to discover that their daughter has the motor skills to perform new signs and that she is making great efforts to speak as she signs. This clever little girl is using the app as a conversation piece with her parents. A very productive and positive interaction is happening between the little girl and her parents. In his book "Sign With Your Baby", Dr. Joseph Garcia describes how your eye contact with your baby can lead to great signing opportunities. He terms these "Gazing Moments". According to Garcia, there are three distinct types of gazes: expressive, pointed, and chance mutual. In this video we see the use of "pointed gazes". Pointed gazes occur when you and your child look at something at the same time and then look at each other. This is an opportunity for you to introduce a new sign to your baby or reinforce an existing one. To illustrate the point, imagine you are out with your baby and a noisy airplane flies by. The sound of the airplane causes you and your baby to look up, and then look at each other. This would be the perfect time to sign and say “Did you see the airplane?”. If airplanes don’t fly in your area, the app can assist you as it contains an image for each sign. Show the baby the picture of the airplane, catch your baby’s eye and then sign airplane to your baby. The above video is a great example of how the app can encourage a baby to perform the hand gestures necessary to communicate using baby sign. However, the baby may not have a sense of how they can use the sign in every day life. The little girl in the video is interested in watching the animated babies sign and even imitates the signs and tries to speak the words. However the true learning still needs to to take place – this may happen later, once the app has been packed away. As the little girl now needs to be shown how the signs are used in everyday communication.For the little girl in the video, learning to use the sign in context probably took place after the video camera stopped rolling. Perhaps later in the day her parents initiated a ball game- rolling a ball to her and then making the sign for ball. The little girl might recognize the sign and smile or she may even choose to sign it back. To reinforce the sign further, her parents may choose to sign ball every time they play ball with their daughter. One day the little girl might see the ball and surprise her parents by signing ball to them – because she wants to play and she knows how to communicate this to her parents. It is at this point that her parents will know that they have successfully taught her how to baby sign!